A new year already? You know what that means: It's time for Raichlen's predictions for barbecue trends in 2017. The good news? More people are cooking a wider range of foods on a more diverse selection of grills and smokers, using more interesting fuels and flavorings than ever before. The bad news? There is no bad news. Just more great grilling and smoking for the year to come. How (or more precisely, HHOW) our food is raised matters as much as how we grill it: HHOW stands for Heritage/Heirloom/Organic/Wild. In the coming year, more than ever before, the provenance of our food will matter as much as the seasonings and grilling techniques. This means heritage pork and chicken breeds, like Mangalitsa pigs or Rhode Island Red roosters. Heirloom tomatoes and other flavorful vintage vegetable varieties. Organic? You bet, because I don't want to eat GMO foods bred to resist pesticides. (I don't want pesticides, period.) And wild, because you can't beat the texture and flavor of wild shrimp and salmon--even if you have to wait for them to come into season. Bottom line: HHOW foods are not only better for you; they taste better, too. Breakfast on the grill: Two of the things I love best in life are the cool calm of daybreak and firing up my grill. Which means a morning ritual in the Raichlen household: breakfast on the grill. 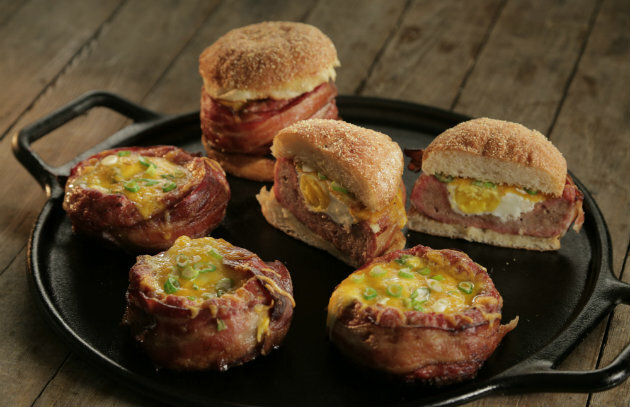 And ever since our "Breakfast on the Grill" episode of Project Smoke on American Public Television, a lot of you are waking early to grill breakfast. Grilled French toast. Smoke-roasted eggs. Mile-high pancakes and beer-can breakfast burgers. Believe me, they're worth waking up early for. The Middle East heats up: OK, I'll join the bandwagon here, because every food magazine and foodie website is touting the boom in contemporary Middle Eastern restaurants. Of course, I've been celebrating the vibrant flavors of Middle Eastern grilling since Barbecue! Bible and Planet Barbecue. To add to your repertory this year: grilled eggplant salad; turkey shawarma; grilled pita with zataar; Palestinian chicken; and more. Tweezer 'Q: It was bound to happen. As more and more fine dining chefs open barbecue restaurants (think Santa Monica Michelin-starred chef Josiah Citrin, who opened Charcoal in Venice), barbecue is becoming increasingly refined. Case in point: the Wagyu brisket served at Kyu in my hometown of Miami. Smoked low and slow, this admirable brisket comes served in baby finger-size slivers to be wrapped in lettuce leaves with Asian condiments and eaten with ... chopsticks. Really. And really good. Look for more high falutin chefs to bring their culinary finesse to barbecue. Caveman everything: You all know my caveman T-bone (steak grilled directly on the embers) and I hope more than a few of you have tried it. What you may not realize is how fantastic this primal grilling method is for other foods, from the ubiquitous eggplants (think baba ganoush) and peppers (think Mexican rajas) to a delicate shellfish you might not think of cavemanning: shrimp. (A specialty of Primitivo in New Orleans, it's delicious.) Did I mention caveman corn (roast it long enough to burn off the husk) and caveman pumpkin (makes the smokiest pumpkin pie ever)? How about caveman pineapple for dessert? The rotisserie renaissance: When it comes to roasting a chicken, nothing beats spit-roasting. Ditto for prime rib. But how about a whole striped bass? Or a head of cauliflower? Or a whole pineapple? The truth is that spit-roasting (especially when you do it over a wood or charcoal fire) combines the best of direct and indirect grilling. As in indirect grilling, the gentle heat cooks large cuts of meat (and vegetables) through without drying them out. As in direct grilling, you get a luscious, smoky, seared crust. If you don't own a charcoal-burning rotisserie, get one for your kettle grill, and if you do, use it to spit-roast everything. For six more trends, visit BarbecueBible.com.